This country opens its arms wide to all visitors wishing to discover its rich cultural history with its colonial districts and its heritage of nature scattered among the mountains, the beaches and the valleys. It is a place also preferred by whales and dolphins during mating season. It's a splendid show to experience. The sporty tourist will be delighted by all the possibilities offered such as diving, pedestrian excursions, golf and even palpitating expeditions like rock climbing or white water rafting down the rapids near Jarabacoa. 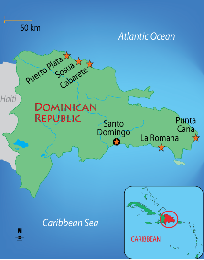 The Dominican Republic is; a romantic island, an ideal place to serenade your beloved one; then enticing to relaxation with its siesta after lunch hours practised by its people laying in their hammock; other times energising where one takes taste to dance at nay moment or place always with a smile on their lips.